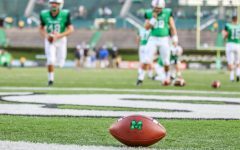 Redshirt freshman quarterback Isaiah Green warms up before Marshall's home opener. 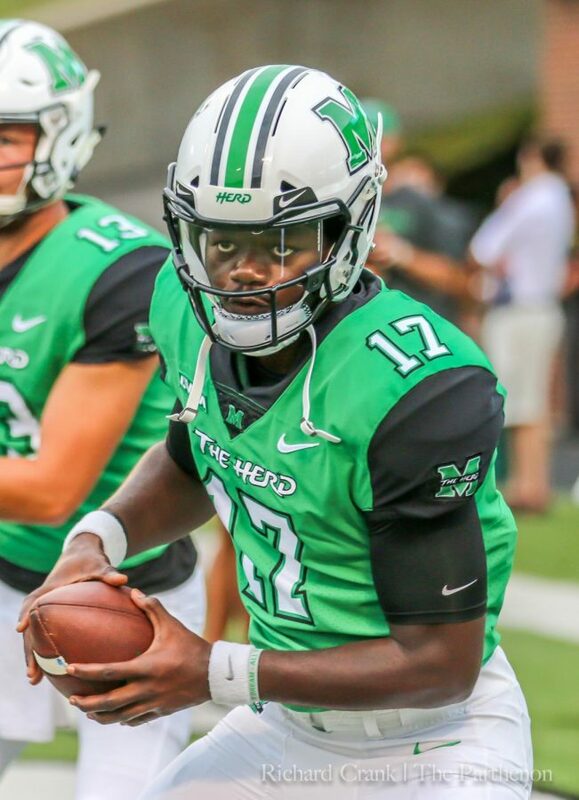 Green is the youngest Marshall starting quarterback since Rakeem Cato in 2014. 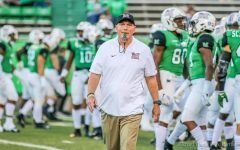 The Marshall football team blanked UTSA Saturday 23-0 at Joan C. Edwards stadium. 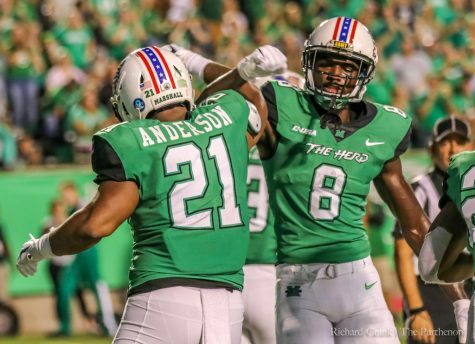 With the win, the Herd improved to 7-3 (5-2 Conference USA), and UTSA moved to 3-8 (2-5 C-USA). 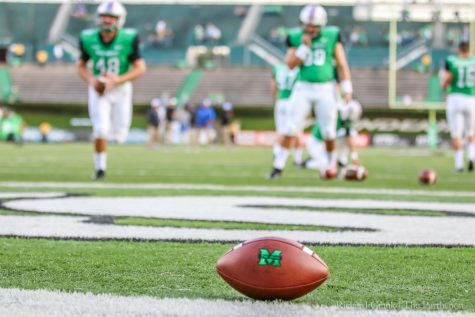 Marshall got on the board first, 3-0, after a 26-yard field goal by redshirt junior kicker Justin Rohrwasser. 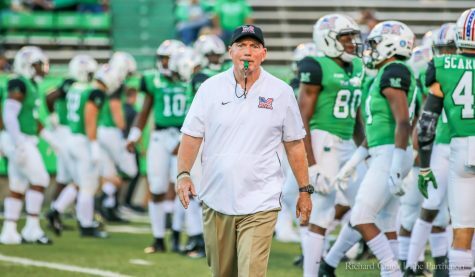 Seconds later, Marshall redshirt senior linebacker Chase Hancock forced a UTSA fumble on the kickoff return and Rohrwasser recovered. 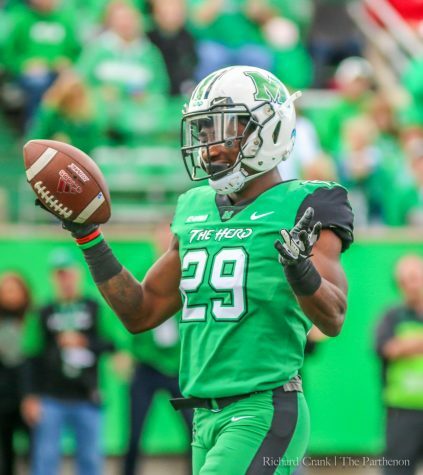 Then, on a one play, six second scoring drive, Marshall redshirt freshman quarterback Isaiah Green found redshirt senior wide receiver Tyre Brady for a 37-yard touchdown pass to make the score 10-0. Brady finished with six catches for 162 yards and one touchdown, a season-high. 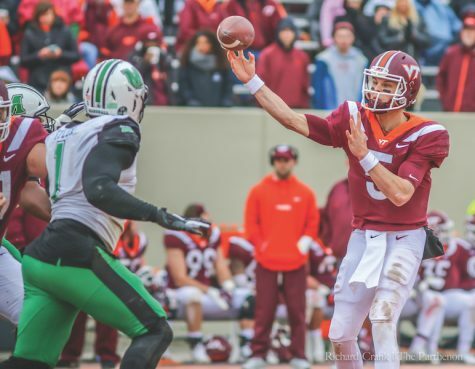 Green completed 19-of-36 passes for 387 yards and two touchdowns, setting a career-high for passing yards. 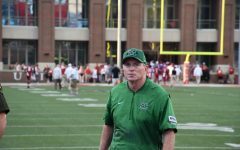 Green acknowledged the Herd has to take more advantage of red zone opportunities. With five minutes left to play in the first quarter, UTSA attempted a fake punt but failed to get the first down. 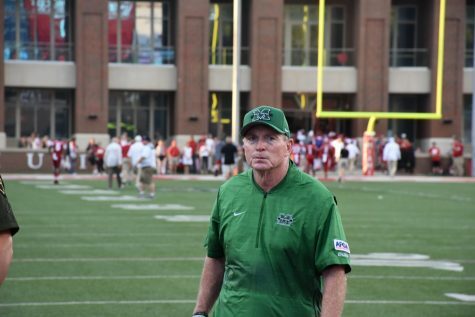 Marshall’s defense did not allow a Roadrunner first down in the first quarter. 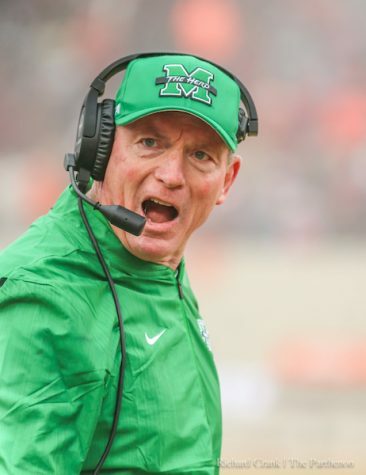 On the first drive of the second quarter, Marshall had a 40-yard field goal attempt blocked. 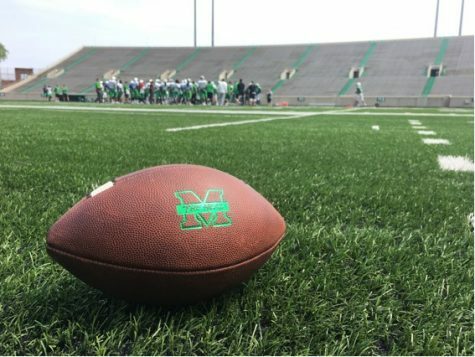 With three minutes to play in the half, Marshall extended its lead 17-0 after an 8-yard touchdown pass from Green to junior wide receiver Artie Henry. With three seconds left in the first half, Marshall’s Rohrwasser completed a 21-yard field goal to make the score 20-0. 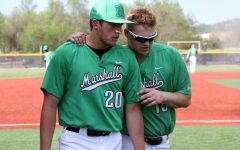 It was senior night for the Herd, and 17 seniors were honored before playing their last game with Marshall. 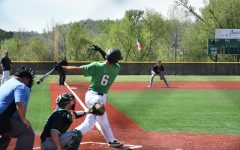 Junior linebacker Omari Cobb acknowledged the seniors needed to go out with a win. It was a quiet second half, with only one scoring drive by the two teams. Rohrwasser kicked a 25-yard field goal in the third quarter to extend the Herd’s lead and make the final score 23-0. 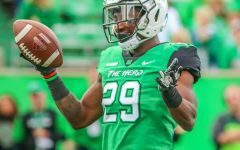 Marshall had 505 total yards on offense, while UTSA only had 137. 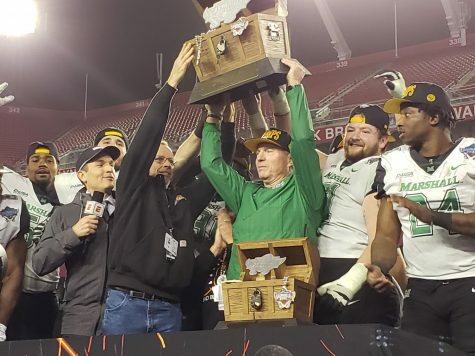 Statistically, it was a productive night for the Herd. 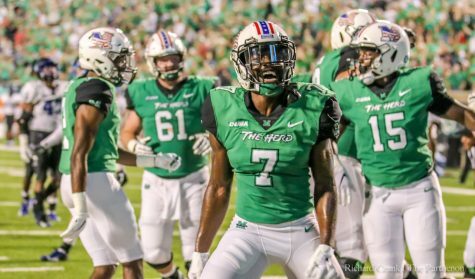 The defense set a school record for rushing yards allowed (-26) and recorded five sacks and nine tackles for a loss. 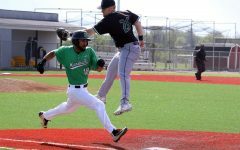 Junior wide receiver Obi Obialo set a career high for receiving yards (103), and Brady had a season high for receiving yards (162). 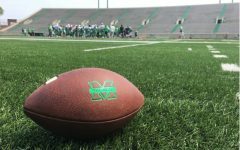 The Herd’s final regular season game is Saturday Nov. 24 versus FIU at Riccardo Silva Stadium.